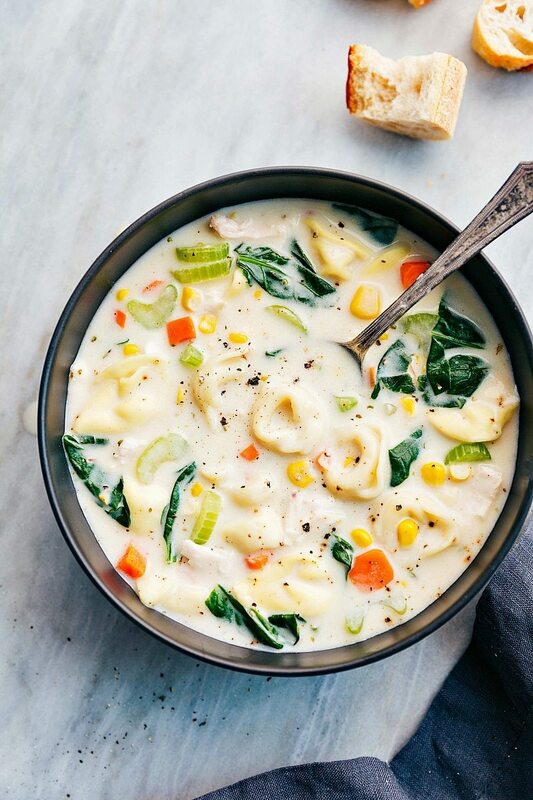 Creamy chicken tortellini soup with veggies — easy, hearty, delicious, and ready in 30 minutes! So to be totally honest, chicken noodle soup has never been my favorite. It was always my mom’s go-to the second we were sick, and well, I would always feel *just* well enough to avoid the soup. Seriously though, I’m not sure what it is about it, but I’m not really a fan. Oh, and I should say, it has nothing to do with the way my mom prepares it. I’ve had dozens of versions and while some are better than others, none are my favorite. But add in a delicious cream base plus cheese-filled tortellini? Well, I’m all over it. And while it’s technically far off from a regular chicken noodle soup, it’s still got the same basics – noodles, chicken, and lots of vegetables. Carrots, celery, onion, and corn to be exact. 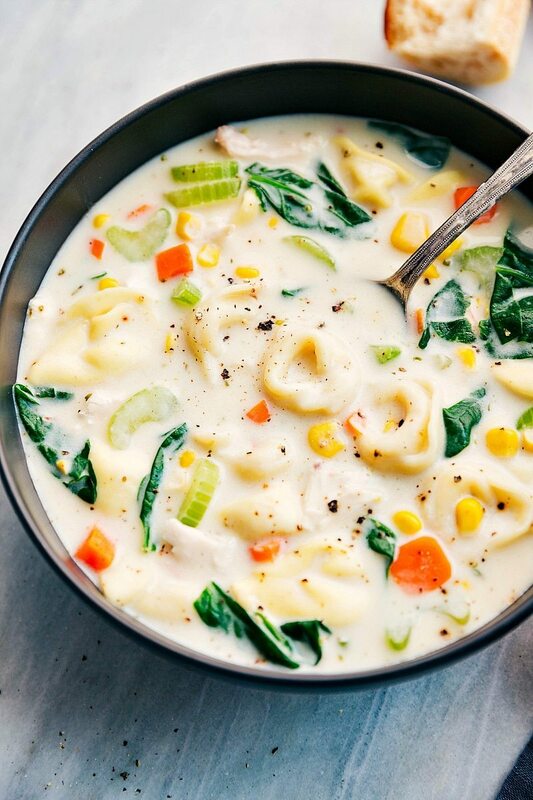 Creamy chicken tortellini soup with veggies -- easy, hearty, delicious, and ready in 30 minutes! Heat olive oil in a large pot over medium-high heat. Add onion, carrots, corn, and celery and saute until crisp tender, about 4-5 minutes. Add the garlic and saute for another minute. Add in chicken broth, chicken breasts, oregano, parsley, thyme, Italian seasoning, and salt & pepper. Bring to a boil, then reduce heat to medium-low, cover pot with lid and allow to simmer 10 - 15 minutes until chicken is completely cooked through. While chicken is cooking, melt butter in a medium saucepan over medium heat. Add flour and cook, whisking constantly 1 minute. While whisking vigorously slowly pour in milk. Season with salt and pepper and bring mixture just to a light boil, stirring constantly. Remove from heat and set aside. Remove cooked chicken from soup, let cool slightly, then shred with two forks.. Meanwhile, add tortellini to soup in pot, cover pot with lid and follow package directions to cooking the tortellini. Add in spinach during last minute of cooking time. Stir in chicken, white sauce, and heavy cream. Serve with parmesan cheese. Chicken noodle has always been a favorite of mine, but I agree, had in some tortellini and make it creamy and it’s amazing! I love this soup, Chelsea! Sounds so flavorful and comforting during the winter, or anytime! Pinned! BUT, I like stuffed pasta goodness more 😉 Pinned! I never can get enough soup in my belly. 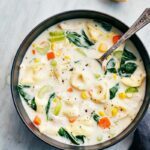 Love this creamy tortellini soup. What pretty colors too. Hope you had a wonderful Thanksgiving Chelsea! This is just what I need tonight! I have been hit by a nasty flu bug and I all I want is some major comfort food ! Mhmmm! This looks amazing, Chelsea! We just had our first big rain day (I live in CA so it’s sunshine most days) and this would have been so cozy to eat by the Christmas tree with the pitter-pattering in the background. Also, LOVE tortellini in soup! Just posted an Italian meatball/tortellini soup recipe for my blog a few days ago as well. The cheesy pasta bites are divine! This is ultimate comfort food… love it! Yum! I can totally imagine how delicious this soup can be. All the ingredients are so flavorful and the added cheese totally makes it so tasty. yes! my kids are going to love this! it looks delicious! I am craving soup, soup, and more soup lately! 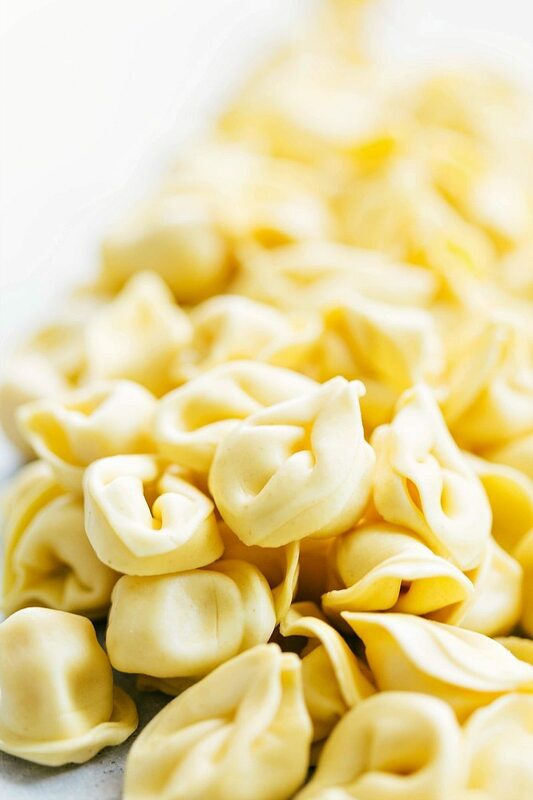 You are just brilliant to add tortellini to chicken noodle soup. This looks incredible, and I love how full of veggies it is too! I have never been a huge fan of regular classic chicken noodle soup either. It’s fine but not my favorite by any means! But this … with the tortellini and the creaminess? I think I could definitely get behind this!! comfort food at its best. My sister’s favorite is tortellini so I am going to have to make this soup for her! This looks amazing, Chelsea!! I love that you used lemon pepper . . . I throw that in everything. I LOVE chicken noodle soup, but if I had to choose, I’d definitely go with a cream-based soup, so much more comforting! Looks perfect Chelsea! What a great idea! I’ve switched up the shape of the pasta ( noodles, bowtie, penne etc.) but never even thought of adding tortellini ! pinned! The tortellini is such a smart addition! You get the cheesy and creamy without a ton of heavy whipping cream. I love soups this time of year, they’re the best! This chicken tortellini soup is all I am craving right now Chelsea. It looks so creamy, comforting and delicious – perfect for the weather right now too! I would love to make this soup – looks so hearty and delicious! Is there a substitute for the cream starter? My children have food sensitivities that have kept me on my toes. I must imagine there is a dairy of some sort and a thickener in it, right? Hi Heather! Absolutely! I’m not sure what the food sensitivities are, but I’m sure a heavy cream would work. Another option would be to do a sort of roux then cream base. I’d recommend 1 cup butter + 1/2 cup and 2 tablespoons flour. Whisk the butter until melted and then add the flour in – whisk until a thick doughlike substance has formed and then continue to whisk for another 2 minutes. Very slowly (whisking constantly and allowing to thicken in between additions), add in 3-4 cups 2% or whole milk. Add in some chicken boullion, salt, and pepper + any other spices to taste. Hope that helps!